Years ago, Deadly Hollow was the site of a horrible tragedy. Gert Van Niekerk, a Boer farmer, murdered his brother in cold blood during a terrible storm. Hanged for his crime, Van Niekerk's ghost haunts the land in the form of a spectral leopard that can appear and disappear at will. And, according to local legend, a "blood curse" haunts the Hollow, where, on dark and stormy nights, the horrible murder is re-enacted. Custance, a recluse with a mysterious past, takes up residence at Deadly Hollow. Troubled by his painful memories, Custance thinks he has finally found redemption and a chance at a new life when he falls in love with the beautiful young Ida Rendlesham. But their lovers' bliss is short-lived. For on a dreary and tempestuous night, Deadly Hollow will witness the fulfilment of the blood curse: a savage murder . . . and a brutal revenge! 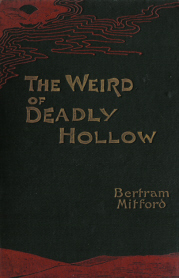 The Weird of Deadly Hollow (1891) was one of Bertram Mitford's most popular novels. Featuring a mixture of romance and terror that builds slowly, but inevitably, towards an unthinkable climax-complete with one of the most shocking scenes of torture in all of English-language fiction-Mitford's novel remains as thrilling today as when first published. This edition includes a new introduction and notes, as well as the complete text of two of Mitford's inspirations: Wordsworth's "Hart-Leap Well" and Thomas Hood's "The Haunted House."